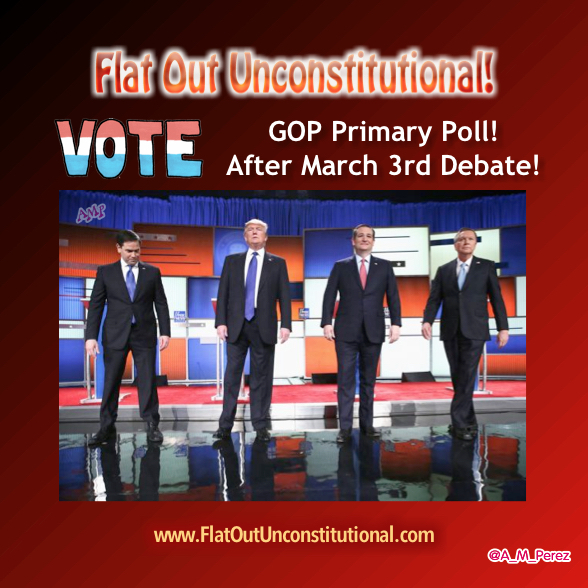 GOP Primary Poll – Post March 3rd Debate! Ben Carson is out! Down to four GOP Candidates! Who would you choose at this point? With all due respect, Ben Carson is NOT out. He made an announcement that he was skipping a debate, as Trump also skipped one of the earlier debates. As usual, the media jumped to conclusions. He is supposed to be making an announcement later today, but it is unknown whether he will then be suspending his campaign or staying on. Carson was drafted to run by grassroots voters because he showed honesty and a desire to serve the people, rather than special interest groups. His campaign has been entirely supported by small donations from regular working Americans. Coming from outside of politics, he had a lot more to learn about the process than most, but has continued to study and refine his positions to develop workable plans to address the problems facing this nation. Since his brief rise in the polls last fall, he has been given very little attention by the media, particularly in comparison to Trump. From the beginning, he has consistently been given less speaking time in the debates than any of the other candidates, including when he was polling much higher than he is now. Data has shown that the media are in fact biased, and manipulate the voters’ perceptions of the candidates, ultimately influencing the outcome of elections. It is really not surprising that Ben Carson would choose to not participate in a debate where he is sure to be ignored while Trump, Cruz, and Rubio duke it out like a bunch of grammar school kids, as they did in the last debate. After all, entertainment and not substance is what the people really want. It is really a shame that the American people would pass up the chance to elect an honest, level-headed, common-sense leader in favor of a loud-mouthed, hot-tempered bully, because the liberal media have done everything they can to convince voters that he is not electable. Ah, I will look into it, but I heard Anderson Cooper say he was suspending his campaign. I’ve never seen a candidate suspend their campaign and then unsuspend it again. I love this site I’m glad to get AMP’ed up. The emotional honesty, the stated fact backed statements, and the tough love for our country. All in language we all understand. This writer has a license to practice law. I really know the layman,needs her professional writing abilities in areas of the readers comprehension & retention is sucessful and a plus to any reader. Simply put the message sinks into the minds of the reader and the results are paramount to the views being understood. Thank You. Anna Marie, for your tired less, and your £irreplaceable time you put forth. You are a patriot, a God blessed messenger, with the strength to go the distance. God Bless America. And God Bless our constitution. The 2nd Amendment is my daily creed.